NUREMBERG, Germany (5-Nov.-2014) – Many Linux user groups throughout Italy met at separate, but collectively themed events on Oct. 25 for Linux Day to promote the use of GNU/Linux and free software. Alexjan Carraturo, a openSUSE advocate, used this year’s Linux Day, which is sponsored by the Italian Linux Society, to promote participation in the openSUSE Project in both Tuscany and Umbria. “openSUSE offers something different and intriguing,” Carraturo said. Not everyone appreciates the value of free software, Carraturo said. One of the greatest satisfactions with promoting free software is the look of surprise people have when they realize that they are not forced to choose only between Microsoft and Apple. 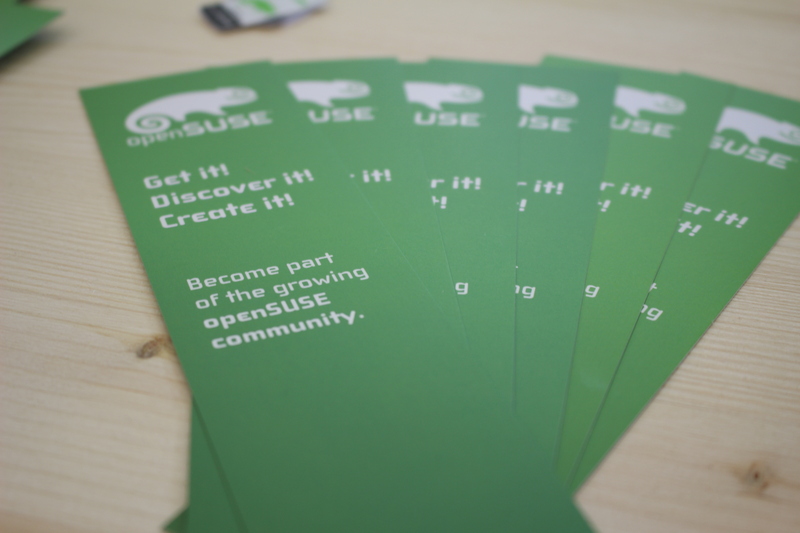 The next openSUSE Weekly News meeting will take place tomorrowÂ (Saturday October 31) at 14:30 UTC. As always, the meeting will be held in IRC on the #opensuse-newsletter channel on Freenode. We using for our Meeting the Meetbot. Please check http://wiki.debian.org/MeetBot for the commands. For more on IRC meetings, see: http://en.opensuse.org/Meetings/About. As always, we meet in #opensuse-newsletter on Freenode. Fire up your favorite IRC client and head over to #opensuse-newsletter. Not familiar with IRC? A good overview can be found at irchelp.org. This site is not affiliated with openSUSE. For more information on Freenode, see http://freenode.net/. Wondering what meeting times are? Check the openSUSE Meetings page. All project meetings and team meetings should be listed there. on IRC meetings, see: http://en.opensuse.org/Meetings/About. OpenSUSE Weekly News #93 is out! Issue #93 of openSUSE Weekly News is now out! * openSUSE 11.2 on its way to become final â€“ Release candidate available! We had overall around 225 persons from all over the world attending. For those who couldn’t make it to the conference we’ll try to publish all presentations and videos if available. A lot of people from Novell’s Nuernberg and Prague offices showed up -Â sometimes only for a few hours – which shows that Nuernberg was theÂ right location for this event.Â Novell VPs and Directors that showed up include Carlos Montero-Luque, Ralf Flaxa, Gerald Pfeifer and Roland Haidl. Thursday evening we had a great party at the Novell offices and Friday and Saturday night a local cinema was presenting the “Creative Common Film night”. We were impressed by the many discussions that formed and the ad-hoc conference sessions set up and the many groups gathered in the hall ways and pretty productively covered a certain topic. We’d like also point out a night time session on Friday night (until 3:30am) where more than 10 people triaged through GNOME bugs for openSUSE (incl. checking whether they are still valid) and hacked on GNOME features like Bacon (banshee UI for Moblin) and Zeitgeist (GNOME 3.0). We had two sessions on how governance in the project does work today and what needs to be changed. Currently most of the decisions are done by experts in their area, the open question is what kind of process is needed in case area experts cannot make a decision. We have decided to move forward in the following way: A small group will now discuss this further together with the board, create a first proposal for public comments and once we have a good proposal, the openSUSE members will vote on this change. We had an RPM summit which Florian Festi (upstream RPM developer emplyoed by Red Hat) joined. Goal was to work on RPM itself to unify RPM usage between openSUSE and Fedora – the end goal is that a valid spec file for openSUSE or SLE is also valid for Fedora/Red Hat and vice versa. Saturday we had a track in German as part of the world wide Software Freedom day which was targeted to people new to Linux. We had pretty many interesting and supporting conversation with some participants that came just for this day. Most interesting to AJ was an incident at the rather big local farmer market in the morning where a person said “Today I go to Software Freedom day”. And AJ recognized this person later that day at the conference. Ulrike Beringer made it happen that 11 journalists attended the conference and had several interviews at the conference with Joe Brockmeier, Michael Meeks and Andreas Jaeger. Comment from our PR agency was: “The feedback of the journalists was very positive, as you can see in the report some of them even published several articles at once. Hence from our PR perspective the event was a big success!” RadioTux interviewed various participants for podcasts of more than 90 minutes. Thanks to Ulrike for setting this up! The flickr photos are also shown on the osc09 twitterwall that was created by gnokii.Â #osc09 was the hashmark used for twittering about the conference. Issue #31 of openSUSE Weekly News is now out! Issue #30 of openSUSE Weekly News is now out! Issue #29 of openSUSE Weekly News is now out! Issue #25 of openSUSE Weekly News is now out!